The Rex Theatre was built in 1911 by a group of interested men and women, headed by Arthur D. Miles, President of the Canadian Copper Company. The building was erected on the principle that Copper Cliff was large enough to have a theatre of its own. The first play was held in the building in the spring of 1912. The Algoma Amusement Company operated the Rex Theatre in Copper Cliff and the Gayety Theatre in Creighton. In 1911 the office of the Algoma Amusement Company was located at 31 Balsam Street, along with the Central Livery. By 1916 the Algoma Amusement Co., Ltd, had moved to 6b Serpentine Street with Daniel Robert McKinnon as President and Richard W. McKinnon, Manager of theatres, amusements, etc. After a few years operation under the Algoma Amusement Company the theatres were bought by J. R. McKinnon & Sons of Copper Cliff, who had control of them until 1917. John Romantius McKinnon owned a department store at 6 Serpentine Street, and another at 292 Poplar Street (now Collins Drive). The Rex was operated by Johns’ sons Daniel Robert and Richard McKinnon. The Rex Theatre was located at 13 Market Street, in front of No. 1 Mine. Today there is a house at 13 Market Street, and the mine, now capped off, is behind the Barber Shop at the corner of Market Street and Godfrey Drive. During a fierce wind storm in March of 1913, the ‘Good Friday Blow’, with 130 kilometer per hour gales, the chimney of the Rex Theatre went through the roof and fell to the stage. “A record crowd attended the new Rex on Saturday night [November 1913], there being 792 paid admissions which is ample testimony to the popularity of the new management. A splendid program was gone through; 4 reels were advertised, but 5 were shown. Miss Pearl Croteau, of Sudbury, and the very popular “Kip” McLean rendered a duet from the “Count of Luxenburg” in splendid style, and Miss Croteau sung “Annie Laurie” with great expression as a solo. A feature of the entertainment was the 5-piece orchestra which will play every night under the direction of Mr. Grenon. Mr. Childs, who made a great name for himself as a violinist at Creighton, has been transferred to the Cliff. He will play in the “Rex” orchestra every night.” In 1914, Reg Childs, leader of the orchestra left for San Francisco to join a former vaudeville partner. In February of 1915 a new policy was implemented that the prices would remain at fifteen cents every night. Formerly, prices were fifteen cents on Mondays and Wednesdays, twenty-five cents on Fridays and ten cents the remainder of the week. It was said that it was worth the price of admission alone to hear Prof. Childs and his orchestra. During World War I, entertainment was important in boosting community pride and the war effort. 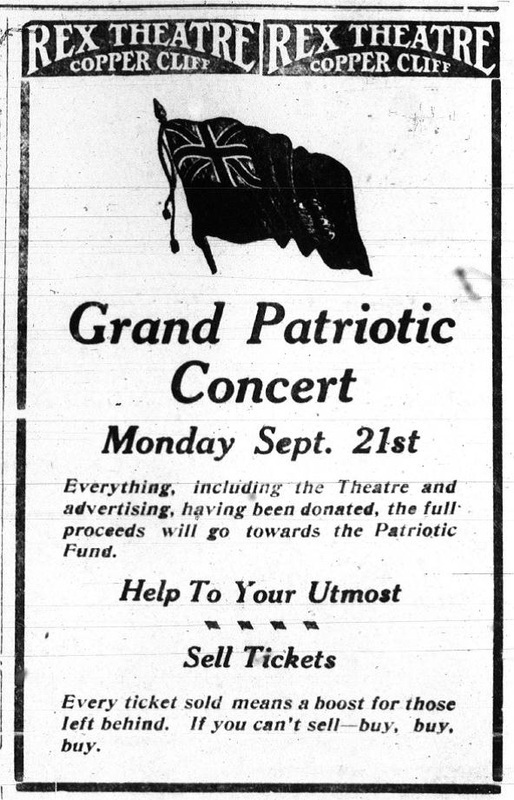 A Grand Patriotic concert was held at the Rex in September 21st 1914, with full proceeds to go towards the Copper Cliff Patriotic Fund. Proceeds topped $150. On April 27th, 1915 there was a big concert given by the band of the 97th Regiment in the Rex Theatre, with the idea of using the proceeds to provide some extra comforts in the trenches for the boys of the 97th Regiment. The Sudbury Company formed in 1896 became the nucleus of the 97th Regiment of Rifles. The 97th Regiment (Algonquin Rifles) recruited to its full active strength and supplied 12 officers and 251 other ranks to the 15th Battalion, Canadian Expeditionary Force during World War I. The Copper Cliff Cadets attended the Rex Theatre in a group, to hear Dr. Girdwood, a war correspondent, talk on the topic. The Rex Theatre Orchestra played at a January 1916 skating party hosted by the Central Club boys of Copper Cliff, and was the first live band to play at the Copper Cliff Club. Features included “The Devil’s Pay Day” with Franklyn Farnum, the serial “The Purple Mask”, “War of the Worlds”, “Cameo Kirby”, “The Seats of the Mighty”, “America”, “Birth of a Nation” (an orchestra of ten pieces accompanied this production), “The Mysterious Mrs. M” and “Mrs. Wiggs of the Cabbage Patch”. In 1917 the Rex passed into the hands of D. L. McKinnon & Son, grocery merchant at 63 Cedar Street in Sudbury. Daniel Laughlin McKinnon’s son Frank managed the theatres. Daniel Laughlin McKinnon came to Copper Cliff in 1889. Daniel was born November 1, 1853 at Delora, near Marmora, Ontario. In 1891 he was president of the newly-formed Copper Cliff baseball club. Daniel was married to Ellen Celina Price, sister of Charles V. Price, and for a time the department store was run by McKinnon and Price, with T. M. Kirkwood retaining the wholesale department. Daniel and his wife road horseback between Copper Cliff and Sudbury. Daniel was a Councillor for McKim Township in 1893, and Reeve until 1898. In January, 1905, Daniel had a township named after him, as well as McKinnon Creek in Rose Township. The Rex hosted public, political and community meetings. A Navy League of Canada rally was held at the Rex in August of 1918. In July of the following year the theatre was temporarily closed due to hot weather. In 1921 J. A. Greenaway was the film operator for the Algoma Amusement Company, living at 11 Serpentine Street, the Millen Boarding House. Reginald Gustin was the Theatre operator, living at 16 Clara Belle Road. After 1922, with a downturn in nickel production, the theatre was only used periodically. While the Rex Theatre at Copper Cliff was being heated in preparation for a show on Saturday evening January 24, 1924, it caught fire from some cause not yet explained and was totally destroyed. The fire started shortly after 6 o’clock and the building was not occupied at the time. The flames had a good start before the firemen were notified and the frame building was a mass of flames when they arrived. With the temperature far below zero, there was trouble with a frozen hydrant but they soon had water available and then devoted their attention to saving the residences adjoining the theatre and in this they were successful. Firemen were ably assisted by citizens. In two of the houses, the owners removed part of their furniture in the expectation that the fire would spread. The firemen received may commendations on their good work. The big frame theatre building burned to the ground in less than half an hour and was a total loss. The building was an old one and with contents was valued at about $12,500. The building and contents were covered by insurance. The fire created quite a bit of excitement in Copper Cliff and several residents in the neighborhood of the theatre were calling up their insurance agents to make sure that their policies were in force. One woman called a Sudbury insurance agent and wanted to place a second policy for $1,000. on her home in a hurry. Another was determined to save her beloved phonograph and packed it a considerable distance from her house which was threatened but was not damaged.